The banquet facility is a great place to hold your next party. The facility is bright and airy and can hold up to 150 party guests. There is also a terrace with a great view of the surrounding area at Donaldson Park. The caterer's kitchen is also available for use with the rental of the banquet room. A caterer’s kitchen is available for use with the rental of the full banquet facility. The kitchen contains a refrigerator and a commercial warming oven. 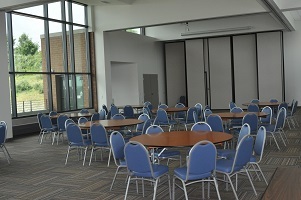 Members of the North Fayette Community Center, residents, and surrounding community residents may rent the party rooms for private parties, meetings, and social functions. The entire party room accommodates up to 60 guests. The large room can be divided into two smaller areas which hold up to 30 people each. 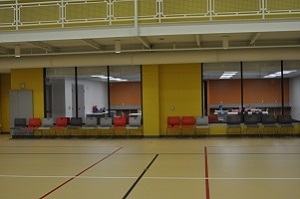 The party rooms are located on the first floor next to the gymnasium. The party room can be rented individually or in conjunction with the gymnasium. The birthday party package includes two consecutive hours in the gym and party rooms. If interested in booking this package contact the North Fayette Parks and Recreation Office directly at 724-307-3725. All other facilities can be booked online . Our facility contains an indoor walking track which allows for exercising all year long. 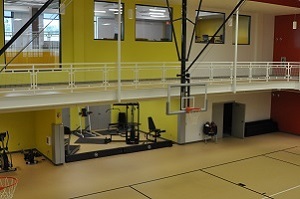 The community center also has an exercise area in the gymnasium. This area has the following equipment available for use: treadmills, elliptical machine, exercise bike, nautilus machine, rowing machine, and free weights. As a member, these amenities are available for use during operating hours. The gymnasium is a regulation size basketball court. 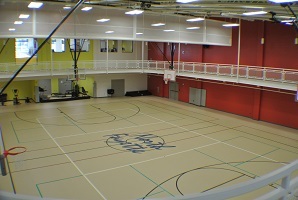 It makes a great space to rent for team sports and recreation leagues. Various types of basketballs, volleyballs and kick balls are available for use. This state of the art facility can also be rented in combination with the party rooms for a great event.